But if you want patterns that use bright colors and use them well, this is the book for you. I counted 25 patterns total: 11 sweaters (including a tank and a baby cardigan), 8 scarves/wraps/shawls, and assorted accessories. The size range for the garments is a little on the small side; there are generally only 4-5 sizes for each sweater. The smallest size is usually a bust measurement between 30 and 36 inches; the largest size is usually between 42 and 46 inches. Like Shibori Knits, another Gina Wilde book, all the yarns are Alchemy Yarns. My favorite project in the entire book is the Clematis Scarf, which is the stunner on the cover. But you can see what that looks like, so here are my picks of the others. Peacock Cardigan (Experienced). This lacy, long cardigan is knit in a worsted-weight yarn and features belled sleeves and a small shawl collar. This small photo really does not do the sweater justice. The bell sleeves add some elegance and edges of this cardigan are beautifully finished, a detail I always appreciate. The only down side is that the pattern is written for four sizes: 30″, 36″, 42″, and 48″. The Impressionist’s Wrap (Beginner). I love ombre, as you know, so this project jumped out at me immediately. 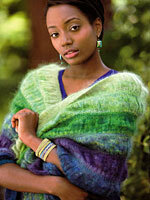 This wrap is worked in Alchemy Yarns Haiku, which is a luscious silk/mohair blend. Two strands are held together throughout, changing the color of one strand at a time to get the ombre effect. The stitch pattern creates a slightly ruching at the color changes. Somewhere Over the Rainbow Gloves (Intermediate). This is a basic glove pattern highlighted with beautiful floral embroidery. The embroidery chart is included, but you will have to find an embroidery reference if you don’t already know how to form the stitches. The pattern is written for one size, a women’s medium (8″ palm circumference). CogKnition posted this on January 24th, 2010 @ 6:13pm in Book Reviews | Permalink to "The Alchemy of Color Knitting"